This C.W. Post Monument can be found at Monument Park, on the corner of E. Michigan Ave. and Division St. N., in Battle Creek, Michigan. This monument was the first statue placed in the park. The monument was dedicated in May, 1917. C.W. Post was a successful businessman in Battle Creek. His legacy can still be found around Battle Creek. Post Foods, originally known as Postum Company, is still in operation at its' original location. The Post addition, as it is still known today, was an area where C. W. Post bought land and built homes to sell to his workers for an inexpensive price. There have been many building througout the years with the name Post attached: Post Tavern, Post Theatre, Post Park and others. C.W. Post is a Michigan Historic Site. The marker is inscribed with: A native of Springfield, Illinois, Charles William Post came to this city in 1891 as a patient at the Battle Creek Sanitarium. In 1892 he opened his own sanitarium and dedicated himself to developing and manufacturing healthy food products such as Postum, Grape-Nuts and Post Toasties. Post considered advertising to be "the sunshine that makes a business plant grow," and he touted his product as "food never touched by human hands." By the time he died in 1914, C.W. Post had amassed a multi-million dollar fortune. I am sure my World War One era ancestors would be amazed at all the technological changes that have happened since the start of World War One, one hundred years ago this week. They wouldn't have had a clue as to what social media was. They would have written letters to get news back home, or sent a telegraph, which usually meant bad news in those days. We don't have to wait for a letter or telegraph to learn about World War One these days. We have internet service and social media to help us. Monday, I wrote about the United States World War One Centennial Commission and its' website. World War One Centennial Commission is taking advantage of the use of social media. This got me thinking about what other World War One organizations are taking advantage of social media and using it to commemorate the Centennial Anniversary of the start of World War One. I have highlighted a few social media links for Facebook and Twitter. Searching for World War One or WWI on these two sites brings up many more links. I chose the following because they were current and seemed to have good information. Pinterest is another social media site to check out. Entering "World War One" in the search window will return many pins pertaining to the war. You Tube is a great place to find videos about World War One. Again, add search words to the search window. Do you have a great World War One Social Media site, please leave a comment with the link to the relevant site for my readers to enjoy? 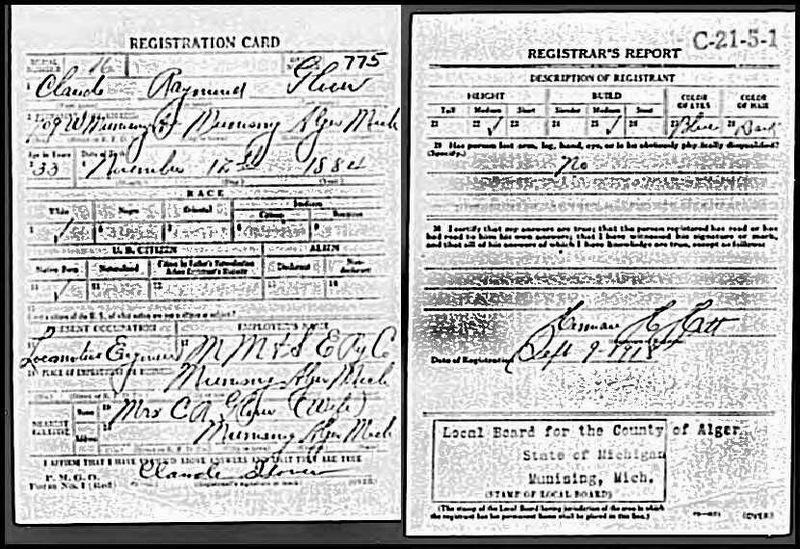 Source: "World War I Draft Registration Cards, 1917-1918," [database on-line], Ancestry.com (www.ancestry.com : accessed 25 June 2014), Entry for Claude Raymond Glover Serial Number 16; United States, Selective Service System. World War I Selective Service System Draft Registration Cards, 1917-1918. Washington, D.C.: National Archives and Records Administration. M1509, 4,582 rolls. Imaged from Family History Library microfilm.. I don't know if it is the centennial anniversary of the start of World War I or something else, but my latest fascination with military records is the World War I draft registration records. I thought I had found all of the men in my family tree who were of the age to register for the draft. It wasn't until I ran a Roots Magic report, which I wrote about here, that I realized I was missing a few. One the registrations I was missing was my great uncle, Claude R. Glover. Claude, was the son of Frank H. Glover and Hattie Fenn Glover, my great grandparents. I learned a few things from Claude's World War I draft registration record. I learned that his middle name was Raymond. I knew he had the middle initial of "R", but never knew what it stood for. I had a description of what Claude looked like at the age of 33. I learned that one of the railroad companies he worked for was M M & S E. Railway Company, Munising, Marquette and Southeastern Railway. The MM&SE merged with the Lake Superior & Ishpeming (LS&I) Railroad in 1923, five years after Claude's draft registration. According to Claude's obituary, dated 9 April 1960 in the Marquette (MI) Mining Journal, he worked in the railroad industry for 52 years; 47 of those years as a locomotive engineer. Claude retired in 1957 from LS&I Railroad. Who would have thought that one little draft registration would reveal such great genealogical information? It gave me new leads to follow. I researched the railroad company he worked for and learned about the various railway merges and name changes that followed 1918, the year the above registration was recorded. I was able to create four additional fact types in my genealogy software program from this one record: Military, Residence, Occupation, and Description. I still have a few draft registrations to process and record, but I am glad I took a second look at the draft registrations. If you haven't search for your ancestors World War I draft registration cards yet, you are missing out on some good information. People of faith across the United States will come together, today, to remember the loss and sacrifices created by World War I. The World War One Centennial Commission, which was established by the United States Congress, partnered with the Washington (D.C.) National Cathedral to help with this occasion. The National Cathedral created faith resources for religious groups to use in their worship today. It is the hope of the Commission and Cathedral that today will bring people of faith together for a day of remembrance, to acknowledge the suffering of World War I and to work towards alleviating future suffering that wars cause. In addition to the National Cathedral resources, there are international resources available here. World War I was known as the Great War, and little did they know at the start of it, that it would not be the only significant war in the 20th century. No matter what your religious preferences are, on aren't, today is a day to reflect on the impact that World War I had, not only on the United States, but on the whole world. Where in the World is Elizabeth Poor Fenn? Elizabeth Ann Poor Fenn, my second great grandmother was the daughter of Samuel B. Poor and Eleanor Begole. She married Daniel C. Fenn between 1848 and 1850. I haven't found a marriage record for them, yet. This is one of the most complete charts I have for an ancestor. I was able to find city directories to fill in some of the gaps. August Guhse was born 23 July 1850 in Schoenberg, Prussia. He was a prominent businessman in Manistee. August Guhse married Ottilie Fredrich, the daughter of my second great grandfather and grandmother, Christoph Fredrich and Susanna Koenig. They married 28 October 1873 in Manistee, Manistee, Michigan. August Guhse died 4 November 1923 in Manistee. His death was just one week after he celebrated his 50th Wedding Anniversary. Manistee News Advocate-Manistee Daily Advocate, 5 November 1923, page 3; column 2, microfilm owned by Manistee Public Library, Manistee, Michigan. August Guhse, 73, died Sunday morning at 10:45 o'clock at his home on 184 Lincoln street from stomach trouble. A week ago last Sunday Mr. and Mrs. Guhse celebrated their golden wedding at the First street German Lutheran church and the following Tuesday Mr. Guhse was taken sick. Until then he had enjoyed good health. His death was unexpected. Mr. Guhse has lived in Manistee for 51 years and used to run a grocery store on Washington street, where Piotrowski's store is now, for a number of years, but of late he has not been doing anything. Mr. Guhse is survived by his widow and five children, Otto of Grand Rapids, Albert of Ludington, Mr. D.J. Champeau of Ionia, Mrs. William Hamlin of Grand Rapids, and Miss Ella Guhse at home. Funeral services will be held Wednesday afternoon at 1:30 o'clock from the home and at 2 o'clock from the German Lutheran church on Fifth Street, Rev Kline officiating. Burial will be in Oak Grove cemetery. Every family has that one person they go to for answers to their family history questions. My go to person is Aunt Lola. Lola Mae Fredrick Brown is 94 years young and her memory is incredible. Aunt Lola was the first person I thought of when I wanted some family pictures identified. The Fredrick's Family Reunion was held July 12th in Brethren, Michigan. My parents, Kirk and I drove to the area the day before and one of the things I wanted to do was visit Aunt Lola. We arrived at Aunt Lola's and my mom and I sat next to her and I pulled out my pictures. I had made copies of about 50 pictures I needed names for. I was a little afraid of overwhelming her and made sure she knew if she got tired she did not have to go through them all. We could stop at any time. I worried for nothing. She was able to identify 42 of the 50! I could barely write fast enough to keep up with her. She named people one after another. Even though she didn't know the names of eight pictures, she knew about them. She would tell me they were teachers at Brethren, or they were Mennonites, or she knew where it was taken. I was amazed and very thankful. The other thing I went to Aunt Lola for was her Spaghetti Sauce recipe. For years, she and later, her daughter, Faith, would bring a roaster full of spaghetti to the family reunion. I was sure there was some special ingredient in it. I wanted the recipe. Faith told me there really wasn't a recipe, as many favorite family recipes go, but she explained how she makes it. Fry one pound hamburger. Season with Salt, Pepper, and Garlic Powder. Add onion and celery. Amount at your preference. Add 1 can small tomato paste and 1 large can tomato sauce. Simmer about 1 hour. Put in roaster, bake at 325 for 1-2 hours. Add tomato juice to keep it moist. I don't see any secret ingredient and I can only guess it tastes so good because it is made with love. Plus, I am thinking the roasting may add to the flavor. Aunt Lola is not only my go to person for identifying old pictures, she is my go to person for Spaghetti Sauce. 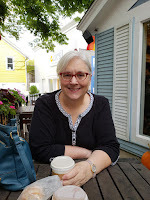 Previously, I wrote about my road trip to the Ypsilanti, Michigan and my visit to the Historical Museum and Archives, but I wanted to dedicate a Follow Friday post just to them, it is that wonderful! The Ypsilanti Historical Society operates the Ypsilanti Historical Museum and Fletcher-White archives and the volunteers do a terrific job of it. A beautiful Italianate mansion is the home of the Ypsilanti Historical Society Museum and Fletcher-White archives. It is located at 220 N. Huron St. in Ypsilanti Michigan. 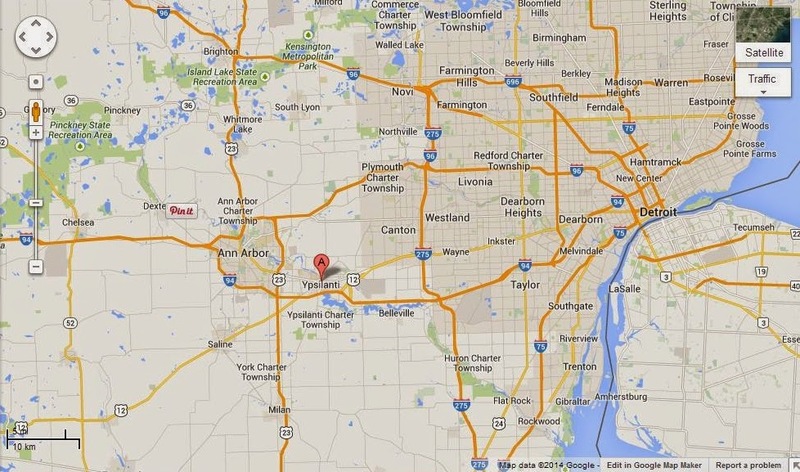 Ypsilanti is about 35 miles west of Detroit, Michigan. The museum and archives are open from 2-5 p.m. Tuesday through Sunday, except holidays. I visited on a weekday, but I appreciate the archives being open on the weekend as I am sure many people are. A volunteer guided tour of this local history museum will give you a sense of what it was like to live in the 19th Century in Ypsilanti, Michigan. The mansion was built in 1860 by Asa Dow. It was a home for over a hundred years, with the city of Ypsilanti purchasing it in 1966. In 1970, the city offered the home to the Ypsilanti Historical Society. The society has spent years renovating the museum. The museum starts in the foyer with a beautiful, open staircase leading to the second floor. Two parlors, kitchen, dining room, library/music room, bedroom, costume room and more are lovingly recreated and cared for, and it is FREE to visit. The archives are located in the downstairs portion of the home. Entrance to the archives is to the left of the main entrance. Materials found in the Archives contains numerous collections. A few examples of the type of information found in the archives includes family Bible records, local history books, cemetery records, church records, diaries, newspaper clippings, obituaries, photographs, yearbooks and more. Be sure to check out the Master Database under Archives Database category for records available in the archives. The master database will take a minute to load, but it is worth the wait as it is filled with unique records and sources that will make your trip to the archives successful. The website of the Ypsilanti Historical Society should be your first stop before visiting. Everything you need to know about the museum, archives and society can be found at their website. The sidebar to the left will guide you through their website. Categories include: Archives Database, Photo Archives, Archives, Collections, Contact Info, Event Schedule, Publications, Vets Project, and Visiting. I believe the website of Ypsilanti Historical Society is one of the best and is very user friendly. Photo Archives: thousands of historical pictures are available online at the Ypsilanti Historical Society website. Digital Photo Archives Project is a joint venture with the Ypsilanti Historical Society and University of Michigan Digital Archives Project. This project will eventually contain about 5000 photos from the 1850's to the present. Publications: The Ypsilanti Historical Society publishes "Ypsilanti Gleanings" and past issues have been digitized and are available online. There are two ways to access Ypsilanti Gleanings. One, is through the society's website here. This provides past issues and a bibliography of the issues. The second way is here. This will take you to the Ann Arbor District Library's page for Gleanings. From here you can browse of search past issues. I have visited a number of local history museums, libraries, and archives over the years that I have been researching my family history. I am always in awe of the work that is done, primarily, by volunteers. Thank you to those who volunteer their time and talent in order that others may enjoy these timeless places. I leave a donation when I visit these repositories, but this was the first time I joined the society. The Ypsilanti Historical Society shows what is good about preserving local history and sharing it with the public. I have given you the highlights of the Ypsilanti Historical Society's Historical Museum, Archives and website, Clicking on the red lettering will take you to the page I am referring too. Don't make that the only places you go on the website, there is so much more to discover and I hope you will take the time to check it out. If you are ever in the greater Detroit, Ann Arbor, Ypsilanti area, the Ypsilanti Historical Museum and Archives is a place you must visit. I don't think Mayor Glover and I would have had the same political leanings as he was a Republican and I am a liberal. Nonetheless, it is pretty commendable of Henry Pierce Strong Glover to run and win the Mayor race for the city of Ypsilanti, Michigan, at the age of 54. Henry P.S. Glover served as Mayor from 1891-1892. Ypsilanti Gleanings, the publication of the Ypsilanti Historical Society, has an excellent online presence and many articles can be found about Mayor Glover in their publication. One article is of particular interest as it is a short biography of Henry P.S. Glover. Henry Pierce Strong Glover was born to Charles Williamson Glover and Mary Ann (Powers) Glover in Webster County, New York on 3 March 1837. He married Nancy Jane Kishler, 17 Apr 1860. Mayor Glover died 21 Feb 1912, in Ypsilanti. The article tells when he came to the Ypsilanti area, where he lived, and businesses he owned. Mayor Glover was described by the Ypsilanti Gleanings as, "Surely one of Ypsilanti's most distinguished citizens." I would agree. Did I Find Lucy Powers Hyde's Burial Place? Last week, I blogged about a visit to Highland Cemetery in Ypsilanti Michigan. I shared the gravestone pictures of Charles Williamson Glover and his, wife Mary Ann (Powers) Glover. I left readers with a question, "Did I Find Lucy?" Lucy Powers Hyde is the mother of Mary Ann (Powers) Glover and Vinera Eglantine Powers Glover, making Lucy my fourth great grandmother. Another Glover researcher, Jan, and I have been looking for information on Lucy for a couple of years now. Jan felt if we could find where Charles and Mary Ann Glover were buried, we might find Lucy. She was right! Lucy is buried in Highland Cemetery in Ypsilanti, Michigan. It took more than visiting the cemetery to uncover this fact. Previously, I wrote about the information I received at the Highland Cemetery Office and the discovery of the burial of Lucy Glover, as written on the burial plot card. I had no idea how Lucy Glover fit into my family tree. The only Lucy I knew was Vinera's and Mary Ann's mother, but she wasn't a Glover. My next step in my research was to find a transcription for Highland Cemetery. I looked on the Genealogical Society of Washtenaw County website, of which I am a member, and found a transcription. This transcription was compiled by David Strong Flower using the transcription taken during the years 1936-1942 by Louis S. White. I searched for Hyde, but no hits. I decided to look through the Glover names and see if there was anything added for Lucy Glover. I couldn't find Lucy Glover in the transcription, but on page 102, in Block 100, next to Charles W. Glover was Lucy Hyer! I now believe that the Lucy in the Glover plot is Mary Ann and Vinera Powers Glover's mother. More research will be needed to prove that this Lucy is Mary Ann's and Vinera's mother, but at first glance I believe it to be so. Here is Lucy's gravestone, found in Highland Cemetery, Ypsilanti, Washtenaw, Michigan. Gravestone for Lucy "Glover" (as written in cemetery office) or Lucy "Hyer" (as written on transcription) or Lucy Hyde (actual name), totally unreadable. Pinterest is my latest social media obsession. I had my own Pinterest page (BrendaLeyndyke) that had genealogy boards on it, but the genealogy boards were getting lost among the recipes, decorating, and garden ones. Last week I decided to create my Journey to the Past Pinterest page. Now when you click on the P in the upper right of this blog, it will take you to the Journey to the Past boards. I find so many pages of information related to genealogy that I couldn't keep those finds organized with bookmarks. I decided to start using Pinterest for this information. I organized my boards by record types, places, tips etc. Also, I added boards that are related to my blog. For example, I pin all my Ancestor Biographies onto an Ancestor Biographies board. I have my Last Day Local-Battle Creek posts on The Cereal City, Battle Creek board. I have said before that I love being organized and using Pinterest helps me stay organized. I have added a new page to my blog titled, "My County Resources". Clicking on My County Resources page will take you to a list of genealogy related resources for Calhoun County, Michigan, the county I live in. Each section has the name of the repository or resource, the address, and phone number, if available. More information can be found by clicking on the bold and red name of the resource. This will take you to the website of the organization. This is a work in progress and I would enjoy hearing from my readers what you think. Do you have any suggestions for other categories to include? Please leave a comment. 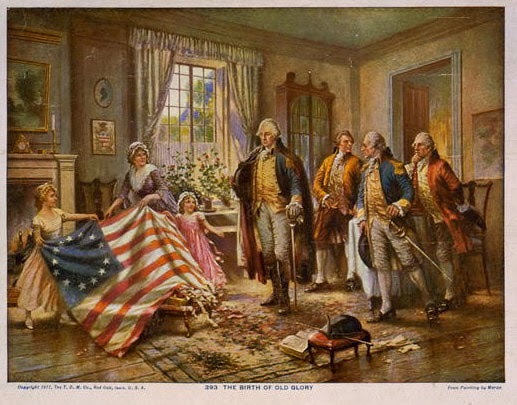 Wishing everyone in the United States a Happy 4th of July! I am enjoying the freedoms I have today, thanks to the men and women who have served in the military in the last 237 years. The first three will be day trips, all within 90 miles of Battle Creek. The last one may require an overnight stay, but could be done in a day if I am really organized, well rested and fed! Last week, Kirk and I, went on our first road trip to Ypsilanti, Michigan. Ypsilanti moved to the head of the list when I was contacted by another Glover researcher, Peter. Peter and I share the same third great grandparents, Samuel Stillman Glover and Vinera Eglantine Powers. Peter had contacted me through my blog and we had emailed back and forth a few times. He told me about the archives housed at the Ypsilanti Historical Society Museum, the Fletcher White Archives. He sent me some of the records he had found there. I was amazed and knew I had to plan my own trip. I am a planner, whether it is for genealogy or any trip. I like to know where I am going and what I am going to do when I get there. I started by running a place report in my Roots Magic software program for any facts with Ypsilanti in them. Next, I ran a place report for Washtenaw county, the county Ypsilanti is in. I used these reports to check for cemeteries I needed to go to. I had two: Union-Udell Cemetery and Highland Cemetery. I had a list of gravestones to photograph. Next, I checked out the Ypsilanti Historical Society website. I used the Archives Database page and read about searching for information in the archives. An excel file can be accessed from this page. Once it loads, and it is worth waiting for it to load, you can use ctrl+f, on your keyboard, to bring a search box up in the right corner. I started by searching for surnames. I found photographs, family files, and books. I made note of the location of the file to take with me to the archives. I was curious what other types of information the archives had and I scrolled through the excel file page by page, it didn't take that long and I found a couple of other resources to check. I read the information about visiting the archives, checked the location of the archives and cemeteries and was ready to go. Kirk and I visited Union Udell Cemetery first. I knew before we went that there wasn't an office onsite but decided to go anyway. It isn't that large of a cemetery that walking it would take too long. We were lucky and found the gravestones we were looking for fairly easy. Next, we drove to Highland Cemetery, arriving right at noon. The office is closed noon to one. Highland Cemetery is a very beautiful cemetery, but huge. We had an hour to wait and decided to blindly search for Glover headstones. We did find them and I wrote about that here. It was now time to visit the Fletcher White Archives, which is in the basement of the Ypsilanti Historical Society Museum, 220 North Huron Street. Parking is available at the museum. You park on the right side of the museum and follow the sidewalk around to the left of the entrance to access the archives. I cannot say enough good things about the archives. We were met by a staff member and she asked if we had ever been there before. I said no. She told us about the archives, how to sign in, about the use of gloves, and handed us a user policy card with procedures and copy prices. I had the list of resources I wanted to check and the staff member went to find them. While she was doing that a volunteer used the computer and looked up my surnames in the Genealogical Society of Washtenaw County newletter index. I started chatting with her and found out she is the President of GSWC, Marcia. I have a lot of ancestors who settled in the Ypsilanti area and knew I would use every bit of the three hours that the archives were open. Peter had visited before me and had the archives scan a bunch of documents and because of this I was able to save some time and the staff member told me I could get the same scans. I had brought a USB flash drive with me and she was able to put the files on that. I was in awe of all the information that was available at the archives. It was a little overwhelming, but the staff was very helpful and answered all my questions, even finding records I wasn't sure I needed. It will take me awhile to process everything I found at the archives and I will be blogging about it in the future. I was so impressed that I joined the Ypsilanti Historical Society and made a donation to the archives. The other thing I did while I was there was to join the Genealogical Society of Washtenaw County. I have been thinking about doing that for awhile now and when I found out I can access past newsletters from home, I did it. Overall, it was a great road trip to take. I left the archives feeling good about what I found. I wanted to make one last stop before we headed for home. I wanted to see the Glover House! I had written a blog post about it, but seeing it in person was impressive. It is so much bigger than what I thought from reading about it online. Ypsilanti is going to be a hard road trip to top, but I have three more I want to go on and after I have processed this trip. I will be ready. If you have any ties to Ypsilanti, Michigan you will want to go to the Fletcher White Archives of the Ypsilanti Historical Society. Do you have any genealogy road trips planned for the summer? If so, where? A recent visit to Highland Cemetery in Ypsilanti, Michigan turned out to be time well spent. The office was closed for lunch when Kirk and I arrived. We decided to drive around and look for Glover burials while we waited for the office to open. Highland Cemetery is a very large cemetery and I wasn't sure we would be successful in our blind searching. Thankfully, the Glover Family Stone was large enough to see from the road. Kirk spotted the Glover stone first and this is what he saw. Kirk and I got out of the car and I was surprised at the twelve Glover burials on this lot. I knew about a few of the burials, but a few were there that I had not expected to be. Before this visit, a Glover researcher, Jan, and I had been talking about our common ancestor, Samuel Stillman Glover and Vinera Powers Glover. Jan and I have been working on finding out who Vinera's mother was. We knew that Vinera's sister, Mary Ann Powers, married Samuel's brother, Charles Williamson Glover. Vinera's and Mary Ann's mother, Lucy, lived with Mary Ann for awhile and was listed in the census as Lucy Hyde. We talked about how we needed to find where Charles and Mary Ann Glover were buried and we might find Lucy. We even joked we would do it if we had to walk through every cemetery in Livingston and Washtenaw county, Michigan! Well, Jan we don't have to walk through every cemetery! I found Charles and Mary Ann Glover in Highland Cemetery in the Glover family lot! Did I find Lucy? Check back next Tuesday, for the answer to that! The two pictures above are Charles W. Glover's gravestone. Reading the face of the stone is very difficult, but I could make out DIED and AGED 75 YEARS. My previous research showed that Charles Williamson Glover was born in 1796 and died in 1871. I spent time taking a lot of pictures around the Glover family stone as there were a number of them that I wasn't sure how they fit into the family. I finished with the Glover plot and walked to the next plot where I found a Blodget family stone. I knew that a Glover married a Blodget and started photographing the stones there. I found twenty six burials in these two plots. The cemetery office was open, now, and I wanted to see what information I could get on these two burial lots. Tina, the woman working in the office, was very helpful. She looked up the information on the Glover plot and the Blodget one. She photocopied the cemetery cards for me. The cards provide the following information: the owner of the lot, Lot number, Block number, date of purchase, purchase price, who is buried in the plot and their grave number, dates of birth and death(on some, not all), and a map of the plot. I had all the names of who was buried in the two plots. I hadn't been able to read all of the gravestones and this was a big help. I have my work cut out for me researching the names of the burials, but I am looking forward to it. Highland Cemetery proved to be a wealth of information. Check back often, for I will be sharing more on my Highland Cemetery finds.